Segmenting audiences is a basic practice in email marketing. From super consumers to influencers, iPhone users to desktop holdouts, learning about your recipient’s preferences is clearly important. In these days of deep personalization, it’s also just nice to know a little more about your customer base. Luckily, this is a pretty easy job with SparkPost message events. In this post, I’ll review the content of the User-Agent header, then walk through the process of receiving tracking events from SparkPost’s webhooks facility, parsing your recipient’s User-Agent headers, and using the results to build a simple but extensible report for tracking Operating System preferences. I’ll be using PHP for the example code in this article, but most of the concepts are transferrable to other languages. SparkPost webhooks offer a low-latency way for your apps to receive detailed tracking events for your email traffic. We’ve written previously about how to use them and how they’re built, so you can read some background material if you need to. We’ll be focusing on just the click event here. Each time a recipient clicks on a tracked link in your email, SparkPost generates a click event that you can receive by webhook. You can grab a sample click event directly from the SparkPost API here. The most interesting field is naturally msys.track_event.user_agent which contains the full User-Agent header sent by your recipient’s email client when they clicked the link. (KHTML, like Gecko) Chrome/41.0.2272.118 Safari/537.36"
Ok, so we can almost pick out the important details from that little blob of text. For the dedicated, there’s a specification but it’s a tough read. Broadly speaking, we can extract details about the user’s browser, OS, and “device” from the user agent string. …you can tell I’m an Android user with a Huawei Nexus 6P device (and that it’s bang up-to-date 😉 ). Some of you might be concerned about the information our user agent shares with the services we use. As is your right, you can use a browser plugin (Chrome, Firefox) or built-in browser dev tools to change your user agent string to something less revealing. Some services on the web will alter your experience based on your user agent though so it’s important to know the impact these tools might have on you. Alright, enough theory. Let’s build out a little webhook service to receive, process, and stash user agent details for each click tracked through our SparkPost account. Note: not all user agent strings will contain the detail we want (or even make sense at all), so we label all odd-shaped clicks with “OS: unknown”. 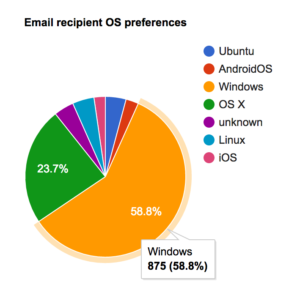 That matches surprisingly well with the Google Charts pie chart data format. All that remains is to collect those summary records in our storage service of choice and render a report. With minimal effort, you could add, filter on, and group the campaign_id field to see OS preference broken down by email campaign. You could use it as a basis for updating your own user database from bounce events with type=bounce , fields=rcpt_to , bounce_class and so on. I hope this short walkthrough gave some practical insight on using SparkPost webhooks. With a little experimentation, the project could be made to fit into plenty of use cases and I’d be more than happy to accept contributions on that theme. If you’d like to talk about your own event processing needs, SparkPost webhooks, or anything else, come find us on Slack! SparkPost Client Libraries: Oh The Places You'll Go! SparkPost's client libraries allow you to access our API in a native-to-them programming language. Easy peasy, lemon squeezy! We broke down our Node.js client library and built it back up on top of a stronger foundation. Aydrian walks you through the updates, we hope you like it.